A substantial increase in common dolphin numbers off western Scotland is to be studied by Hebridean Whale and Dolphin Trust in a new season of marine research expeditions beginning next month. The trust’s encounter rate with common dolphins has more than doubled over the past 12 years. The findings – recently presented to the European Cetacean Society – have emerged from the charity’s unique long-term monitoring of whales, dolphins and porpoises in the Hebrides. The causes – and broader effects on the marine environment and other species – are still unclear. Hebridean Whale and Dolphin Trust is now recruiting volunteers to work alongside marine scientists in its annual summer surveys, which it hopes will shed further light on the dramatic changes. 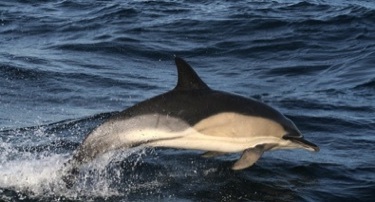 “An increase in common dolphins means that those wishing to encounter dolphins in the wild are in luck – but further research is needed to explain why this is happening, the extent to which this has been caused by human activity, and the implications for other cetacean species,” said Dr Conor Ryan, Sightings and Strandings Officer at Hebridean Whale and Dolphin Trust. Common dolphins come to the Hebrides each spring to take advantage of seasonal food stocks. They are gregarious, often approaching boats to bow-ride and play in the wake, and are smaller than the region’s resident bottlenose dolphins. The species also travels in large groups – sometimes forming super-pods of thousands of individuals. Despite their name, common dolphins – known in Gaelic as leumadair or ‘jumper’ – were once only occasionally seen in the Hebrides, preferring more southern waters generally warmer than 10°C. With climate change causing sea surface temperatures in the Hebrides to rise at a rate of 0.5°C per decade, it appears that such warmer water species are starting to colonise new areas in the north or closer to shore. Yet even as this shift potentially creates new opportunities for common dolphins, it may be generating competition for food with other dolphin species or seabirds. One predicted consequence of warming seas is colder-water species such as the white beaked dolphin being forced to retreat further north. So far Hebridean Whale and Dolphin Trust has found no evidence of displacement of the white beaked dolphin – but continued monitoring is needed to establish whether or not the influx of common dolphins is having a negative effect on such species.